Boekpublicatie door 75B. Het boek doet visueel verslag van hun 4 maanden in Los Angeles als ‘visionaries-in-residence’ bij Art Center College of Design. Het boek is 22x28 cm en bevat zo’n 80 pagina’s (ongenummerd). 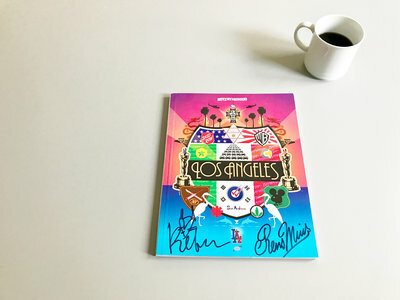 Op de cover staat een hedendaags stadswapen voor Los Angeles. Alle exemplaren zijn gesigneerd door Pieter en Rens. “From May 2006 to May 2007, Netherlands-based design collaborative 75B were visionaries-in-residence at Art Center College of Design. Founders Rens Muis, Pieter Vos and Robert Beckand took turns (4 months each) living and working in Los Angeles while conducting controversial experiments with the students and staff of Art Center. The result is a three act play, a comic tragedy about outsiders trying to lead lives as Angelenos. But 75B are no innocent tourists. Confronted with LA’s density and diversity of cultures, our protagonists say and do the wrong things, sometimes by accident. Rens pimps his ride with vertical flames, and establishes the Association of Associations to tamper with our global infostream; Pieter attempts to bring straight talk back in a big way, after ‘de-signing’ the city; and Robert sets up a mission of party tents as if space were scarce.